Most dreams are the sub-conscious’s way of processing the events of the day or to release internal energy via mental images while in slumber. Dream state is a chance for the conscious mind to quiet and to let the sub-conscious mind play. Memories of most dreams release once you are fully awake and at most, all that is left is a vague sense of the dream or a residual feeling of the dream such as it was happy, sad, or scary. The sub-conscious also communicates to you through your dreams via images and symbols. Sometimes a dream makes no sense as a story but a strong image sticks in your mind that leaves you puzzling it’s meaning and sometimes a dream is so full of symbolism that when you wake up, and if you are self aware enough, you know beyond a shadow of a doubt what your sub-conscious is trying to tell you. That is the kind of dream I had last night. 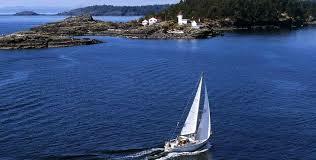 I dreamed I was sailing around the Gulf Islands, off Vancouver Island, in an approximately 8-10 metre sailboat. I know the area around these islands fairly well as this is where I grew up and as a child my family sailed these waters. There was nothing unusual in that except in my dream, I was sailing between islands and kept going into calm, shallow inlets and bays were I had to turn around and try another way. I could see the open water close by, and sensed the wind was stronger there and knew the sailing would be more invigorating, but still I couldn’t find the right path to reach it. I wasn’t afraid or stressed in my dream, I just calmly kept searching for the way out of the watery maze knowing that I needed to get back to the home port where the owner of the boat was anxiously waiting for me to return his boat. I woke up and instantly understood the analogy of the dream, the symbolisms and what my sub-conscious was trying to tell me. I am floating through life right now and getting no where. This is not a bad thing necessarily, the shallow, calm waters symbolise safe emotions, no dramas, but not living deeply from the heart, just skimming the surface. The fact that I was not stressed or afraid in the dream tells me that I am not unhappy about it. The open water is with in sight and I know the experience will be more exiting if I could just focus and get there. Is my sub-conscious trying to tell me I need to figure out a way to break free of what’s safe and maybe just a little boring in my life? The desire for the wind in my face, a faster pace and even the invigorating spray from the choppy open water sure looked inviting. What about the fact that this is not my boat? Why am I not sailing my own ship? Why is the owner so nervous about me being at the helm, I’m certainly not afraid. 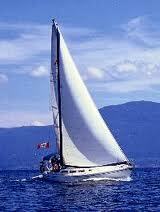 Perhaps by sailing some one else’s boat I have an excuse to stay in the safe, calm, shallow waters. I wouldn’t want anything bad happen to their sailboat after all. Yet, in the end, I know I must return this boat back where it belongs and back to it’s rightful owner and I must get out into the open waters to do so. What chance do I need to take? The universe is constantly communicating to us through dreams, messages in nature, serendipitous events and coincidences and signs and symbols. Sometimes the message comes gently sub-consciously, sometimes in a slap your forehead aha moment, and sometimes as a harsh knock you over your head, didn’t see that coming sort of way. It really depends on the urgency of the message and the willingness of the recipient to receive it. For me, this time the message from the universe came in the form of a dream, gently but clearly administered. If I choose to ignore it, I’m sure nothing bad is going to happen. No hammers over the head will strike, but I may miss an opportunity to sail my life out of the safe, calm, shallow waters that I am cruising right now and steer it into a more exhilaratingly deep, open water adventure… and who doesn’t love a good adventure? I wonder what I’ll dream tonight?